Matthew Lambrecht raises to 4,500 from early position. The player in middle position, and the big blind, call. The flop is . Lambrecht bets 10,000. The player in middle position is the onlly caller. The turn comes the . Lambrecht checks. His opponent bets 10,000. Lambrecht check-calls. The completes the board. Both players opt to check. The player in middle position shows and Lambrecht reveals to win the pot. Jonas Wexler opens to 5,000 from middle position. The player in the small blind is the only caller. A flop reading is dealt. The small blind bet 6,500. Wexler calls. The turn brings the and is checked around to the river. The small blind bets 5,000. Wexler raises to 15,000. His opponent goes deep into the tank and proceeds to call. Wexler tables and his opponent mucks. Action folds to the hijack where Blake Whittington opens to 4,500. The player in the small blind then three-bets making it 16,000. Action folds back to Whittington who calls. The flop is and when the small blind bet 10,000, Whittington counts his stack and mucks his hand, leaving him with about 75,000 chips. 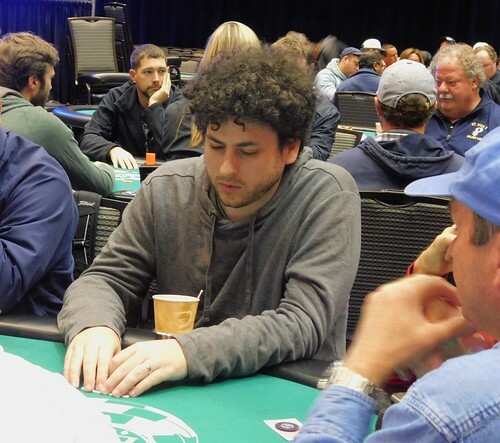 Jared Jaffee opens from the hijack with a raise to 4,500 and he's called by the player in the cutoff as well as the big blind. The flop is and action checks to Jaffee who continues with a bet of 7,200. Both players call. The turn is the and all three players check. All three check again on the river. The big blind shows for a straight and the player in the cutoff shows for a straight as well, so each of then gets a piece of Jaffee's chips when he mucks. Players are now gone on a 15-minute break. The registration period will end at the end of this break. The player in middle position limps, along with the cutoff. Adam Quimby, in the big blind, raises to 9,600. The player in middle position calls. The cutoff folds. A flop reading is dealt. Quimby bets 6,000. His opponent calls. The turn is the . Quimby continues with another bet of 16,000, that is enough to claim the pot. The flop comes and Hankins picks up some hope as he pairs his king along with a backdoor heart draw. The on the turn puts a hammerlock on the hand for Hankins as there are no aces left in the deck. The river is a blank and changes nothing so Hankins is able to take down the pot and double up to right around 85,000 while collecting the side pot as well. Aaron Massey is all in and at risk before the flop and is called by one other opponent. Massey is at risk for 16,500. The board runs out and Massey's queens hold up to earn him the pot allowing him to double up. Jamie Linebaugh raises to 3,200 from middle position. The player from one seat over is the only caller. The dealer spreads a flop of . Linebaugh bets 2,200. His opponent calls. The turn is the . Linebaugh continues with another bet of 4,200. His opponent calls again. The fills up the board and Linbaugh fires 9,000. His opponent lets it go.